This Australia vacation package was designed for a couple celebrating a 30th birthday who wanted to explore the less traveled areas of Australia. This journey brought them to all the highlights of Western Australia, well off the beaten tourist track. They began their journey in Perth, the capital of Western Australia. This laid-back and sunny city is home to some of the best beaches in Australia. They tried some surfing during their leisure time in Perth. Then they spent their last day here on a small group tour of the city’s highlights, cruising along Swan River to the friendly town of Fremantle nearby. They returned through beautiful wine country sipping complimentary Western Australia wines. Next on their Australia vacation package, they self-drove to the Margaret River wine region. This area is considered a hidden gem of Australian wine country, mixing fabulous wine and innovative cuisine with rustic western charm. Then it was on to Broome. They stayed at a luxury resort on beautiful Cable Beach, a 22km stretch of pure white sand, set against a backdrop of red ochre cliffs and fringed by the turquoise waters of the Indian Ocean. Here, they toured Broome highlights and had a very special experience: a sunset camelback ride on Cable Beach. Continuing their Australia vacation package, they enjoyed a 5-night cruise of Rowley Shoals. This group of atolls is home to 3 fabulous coral reefs that are just as vibrant as the Great Barrier Reef, but without the crowds. 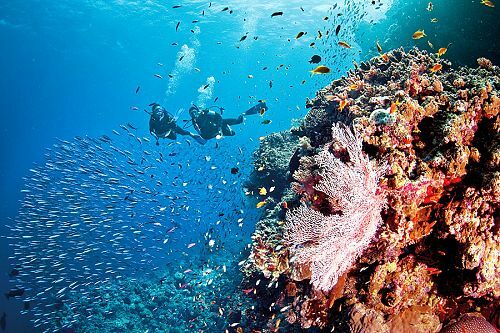 They snorkeled to their heart’s content among the bright corals and more than 600 species of colorful fish. They even swam with humpback whales and manta rays! After this incredible snorkeling adventure, they headed back to Broome and onward to Sydney. They spent a night in Australia’s capital, then enjoyed a private transfer to the airport to catch their flight home. 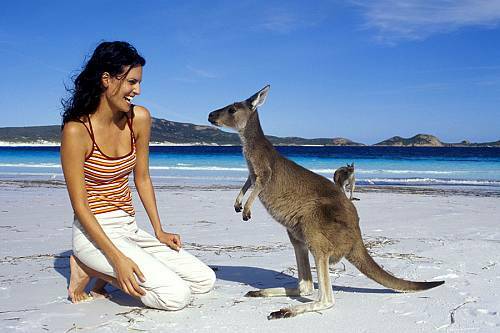 They left knowing they had discovered some of the best—and least traveled—experiences Australia has to offer. Welcome to Australia! 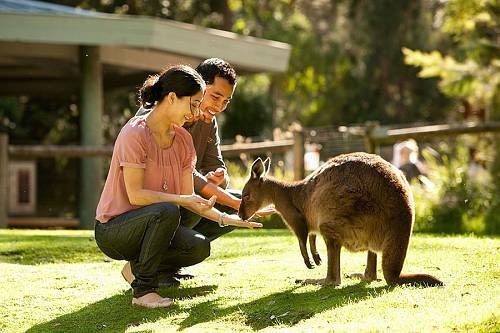 Begin your journey in Perth, one of the less touristed cities and capital of Western Australia. Upon arrival, your driver will whisk you away to one of the city’s best hotels right downtown. Perth is great for off-the-beaten-track urban touring and for getting into the countryside for fine wines, eco-tours, and river cruising. Take some time today to explore Perth on your own. This city is known for its laid-back attitude, fabulous beaches, and vibrant arts and culture scene. Perhaps try your hand at surfing. 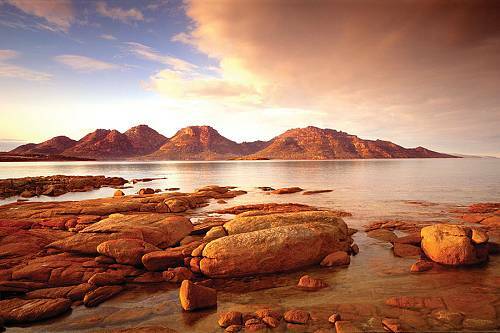 A scenic helicopter flight or aboriginal cultural tour can also be arranged. Spend the day with a small group checking out the highlights of Perth and the charming seaside town of Fremantle, 12 miles away. Travel back to Perth on a cruise up the Swan River, through wine country and lovely countryside, with complimentary Western Australian wine tasting along the way. Pick up your rental car and drive a little ways to the Margaret River region, your home for the next 2 nights. Horse riding, golfing, walking tracks, whale watching, and surfing lessons are just some of the activities available to you in this stunning region. For foodies, enjoy master chef cooking classes or truffle hunting (when in season). Wine lovers will adore beautiful vintages in what is considered to be the hidden gem of Australia’s wine country. Today, drive back to Perth and then fly north to Broome, where your private driver will take you to Cable Beach in Broome. With 3 nights here, you’ll have plenty of time to see why Cable Beach is known for its sweeping, sandy landscape and small-town Western Australia charm. Daytime is at leisure to enjoy Cable Beach and Broome today, but this evening will be something extraordinary. You’ll ride camels on Cable Beach, waves lapping at your camel’s feet as you watch the incredible sunset over the ocean. A gentle rock back and forth makes for a comfortable ride on the back of one of the world’s most fascinating creatures. Enjoy a guided tour of Broome today. Learn about its pearling industry, restaurants, multicultural history, and the scenic wonders of the Dampier Peninsula with mangrove-lined creeks and spectacular sandstone cliffs. The rest of the day is yours at leisure. This evening, embark on a luxurious 5-day cruise aboard the True North through the Coral Atolls. This journey will be focused on snorkeling, fishing, and simply relaxing amidst a breathtaking coral habitat. Enjoy cocktails as the pier slips away. Dinner is shortly after leaving port, and then it’s an overnight steam to the Rowley Shoals. Arrive early at Clerke Reef. Enjoy breakfast before exploring the atoll’s huge lagoon. Marvel at crystal clear waters teeming with life—clouds of fish and corals of every imaginable color and shape. There will be plenty of opportunity for beach combing on Bedwell Island, relaxed snorkeling in tropical waist-deep water, or perhaps some catch-and-release lagoon fishing using eco-friendly tackle. This evening, witness your first spectacular Rowley Sunset from the comfort of the open-air bar. Start the day with a visit to a snorkeling/scuba spot so pristine, it’s known as the Aquarium. The waist-deep water is home to brilliantly colored corals, giant clams, and more than 600 fish species at your fingertips. Then, get the opportunity to try something unique: high-speed snorkel drifts through the outer reef. Expert staff will be on hand to ensure the utmost safety during this once-in-a-lifetime adventure. Tonight, anchor in the waters of Clerke Lagoon. Another day in paradise. Jump in for an early morning swim before breakfast on the deck. Then, your captain will back up the boat within inches of the reef so that all you need to do is walk off the rear steps to access world-class snorkeling. Outer reef snorkeling is a totally different experience—the sheer coral walls will take your breath away. Close encounters with humpback whales, manta rays, and sailfish are also on the agenda. Finish the day with sunset drinks on the beach and an island party. Take an early morning stroll on your very own sand cay before embarking on a leisurely cruise to Mermaid Reef, the Rowley’s northernmost atoll. Spend the day exploring the outer reef of this remote and untouched wilderness and, depending on the tide, you may become one of the few people who have ever walked on Mermaid’s sand cay—it is completely submerged by the tide twice a day. Highlights of the day will include face-to-face encounters with the curious residents of the Cod Hole and the mesmerizing depths of the Northern Wall. Then, all too soon, it’s time for your overnight steam back to Broome. Disembark from your cruise this morning and transfer back to Cable Beach Club Resort & Spa for another relaxing night. Perhaps you’d like to enjoy the resort’s world-class spa, the pool, or the serene meditative garden. Today, fly to Sydney with private airport transfers for some final urban excitement. Cosmopolitan and well landscaped, Sydney is a feast for the eyes with plenty to offer any type of traveler. Your luxurious hotel is just minutes from Circular Quay, the Sydney Opera House, and the Royal Botanic Gardens. A private transfer takes you to the airport this morning for your flight back home. Take comfort in the knowledge that you’ve seen what few travelers will ever see. If you want a truly unique wine experience, check out Sandalford Winery near Perth and be a winemaker for a day. First you can participate in the winery tour, learning about the wine making process, up to the critical blending stage. After your blending class, you will put your knowledge to the test, individually creating your own blend of wine to be judged by wine experts. You can then enjoy your newly blended wine over a meal in the restaurant.